Regulators in the United States are generating a buzz by proposing new rules that would establish temporary pesticide-free zones as part of an effort to reverse the rampant die-off of commercial honeybees. The latest offering from the US Environmental Protect Agency, or EPA, is expected to be published in the Federal Register on Friday this week. According to the Associated Press, it will call for the creation of restricted areas where pesticide use will be prohibited when certain plants are in bloom and commercial bees are trucked in to help with pollination. Commercial honeybees that are brought from field to field by beekeepers account for nearly 90 percent of the species’ US population, University of Maryland's Dennis van Englesdorp added to AP, but they’ve been dying off in droves in recent years due to what some say are problems posed by pesticides. The result has hurt the US agriculture business, given that a quarter of the food consumed by Americans is produced by plants pollinated by honeybees, Reuters reported. Jim Jones, the assistant administrator for chemical safety and pollution prevention at EPA, said the agency wants to restrict the use of nearly all pesticides, including those containing the controversial chemical class known as neonicotinoids. By implementing the rule, he says upwards of 1,000 products involving 76 different chemical compounds would be banned from being used in areas where honeybees are aiding with pollination while certain plants are in bloom. The idea is "to create greater space between chemicals that are toxic to bees and the bees," Jones said. "The acreage may not be large, but the impact is," Jones said. "It's really a function of where the bees are." 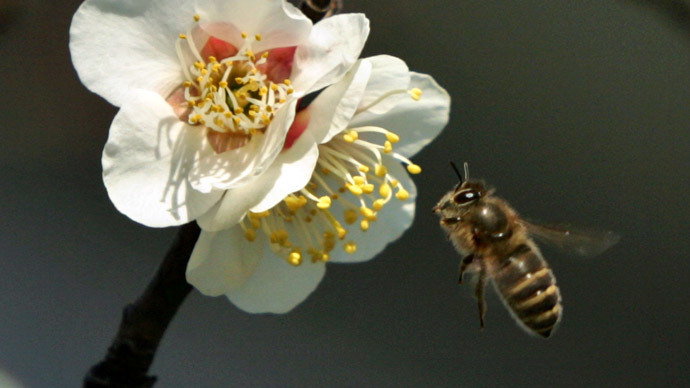 Specifically, Jones told AP that the restrictions would limit pesticide use around almond trees in February and April, and affect what kind of chemicals can be used in April and May when apples and melons are harvested on US farms with the help of honeybees. According to the US Dept. of Agriculture, the period between April 2014 and April 2015 saw the second-highest annual loss ever with regards to commercial bee colonies. Pending a review of comments expected to be made in the wake of Friday’s publication, Jones said new rules and pesticide labels could be ready by next year. Earlier this month, the White House unveiled its National Strategy to Promote the Health of Honey Bees and Other Pollinators as part of the administration-wide effort to try and reverse the trend. The Obama administration has said it wants to spend upwards of $82.5 million on honeybee research in the upcoming budget year, more than double the current allocation of $34 million.